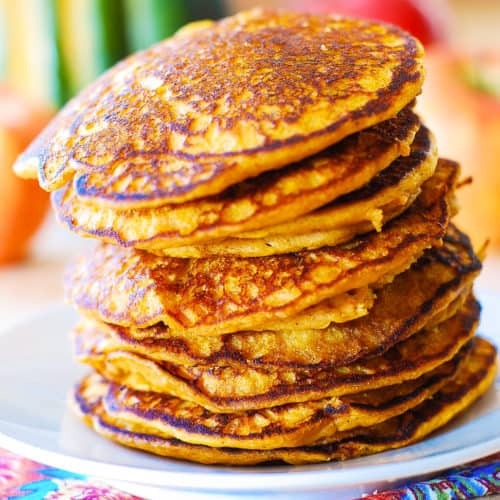 Easy pumpkin pancakes flavored with cinnamon, nutmeg, and ginger – perfect holiday flavors! Fantastic recipe for the Fall and Winter season, as well as for the holidays (Thanksgiving and Christmas). I can’t let the pumpkin season pass by without making at least a single batch of pumpkin pancakes! 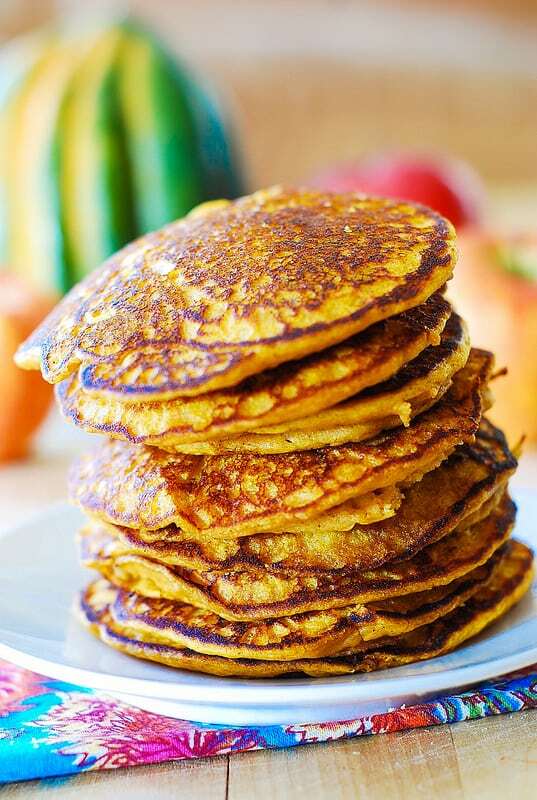 These easy pancakes are packed with pumpkin puree and spiced up with just the right amount of cinnamon, nutmeg, and ginger. Just perfect for the Fall! Imagine serving them for breakfast over Thanksgiving holidays – it will surely make your family very happy. If you love pumpkin, these will be right up your alley, because the pumpkin flavor really comes through in this recipe! They are so good and full of flavor, you can eat them plain, without any maple syrup! Just with a cup of sweetened coffee or tea. Of course, pouring REAL maple syrup over the pancakes will not hurt either! 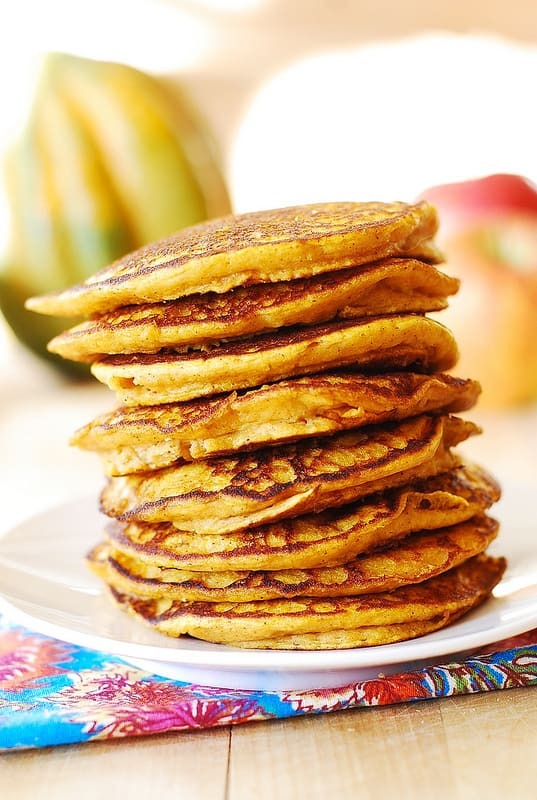 They are hearty pumpkin pancakes: moist, light, fluffy, and not overly sweet! A great addition to your rotation of breakfast recipes. And not only in the Fall or on Thanksgiving – but on any day you feel like eating some pumpkin in the morning. Very easy to make: just combine pumpkin, milk, melted butter, egg, and brown sugar – whisk it really well. Separately combine flour, baking powder, cinnamon, ginger, nutmeg and add these dry ingredients into wet ingredients. Experiment with spices – add more of each spice if you want a spicier pancake. Cook on the griddle on medium heat: the pancakes puff up nicely. As an added benefit, the house smells really nice while you cook them. 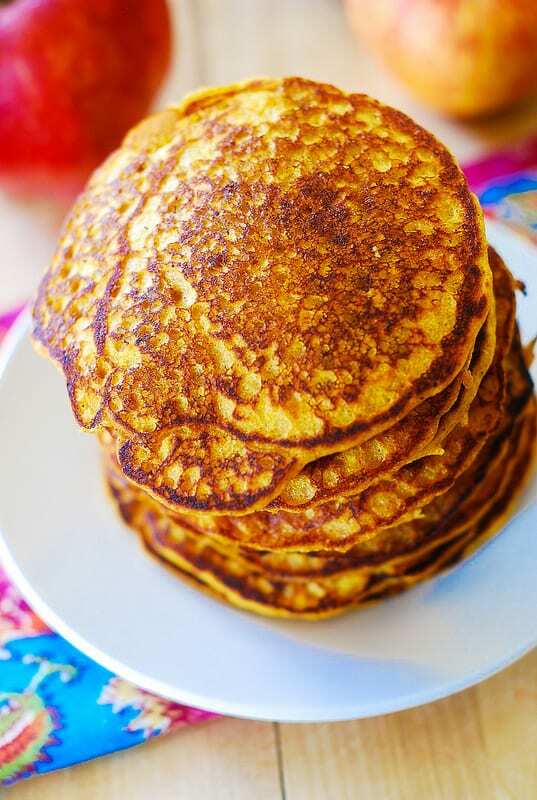 Easy pumpkin pancakes flavored with cinnamon, nutmeg, and ginger are perfect holiday breakfast pancakes. Perfect Autumn recipe. I made these after another recipe turned out good but was more involved. I don’t know if I screeed something up or what but they are very flat. I followed the recipe and it was very watery. So I added some flour but maybe not enough. I was rooting for you but my experience was a fail. Sorry to hear that, and very happy to hear any feedback! Thank you for taking your time to leave a comment! Followed the recipe. Mine turned out very gooey. Never cooked all the way through. I tried on med heat. I tried on low. I tried with a lid over the pancake and without. Seems like they needed more flour or something. I did use fresh squash but i strained it w a heavy weight for hrs like i do when I make pumpkin pie. Not sure why they did work for me as I am a competent cook and followed directions. I’m gonna add choc chips to the recipe. Gkids will love em. These are so delicious! I’m having a hard time getting them done in the middle but they are worth figuring out! This recipe I just tried it and the pancakes wouldn’t bubble no matter how long they sat on the griddle. They wouldn’t cook through at all. Mush mess, why would this happen? I cook and bake all the time. Breakfast ruined. i had the same problem. I had the griddle hot, and not matter how long I cooked them, they wouldn’t cook through… I would say I cooked them for over 10 min. Per gaps the batter was too thick? Maybe less flour and more milk? These had the texture of french toast this morning when I made them. Totally tasty and my twins loved them. Sorry to hear about that! I need to make these again to troubleshoot this recipe. By the way, did you heat the griddle until very hot? With puree based pancakes, I find that I have to get the griddle really hot to make sure nothing sticks and everything cooks through.